In the encounter, Mumbai attack mastermind Zakiur Rehman Lakhvi's nephew Owaid along with five other Lashkar-e-Taiba (LeT) terrorists, were gunned down by security forces here. 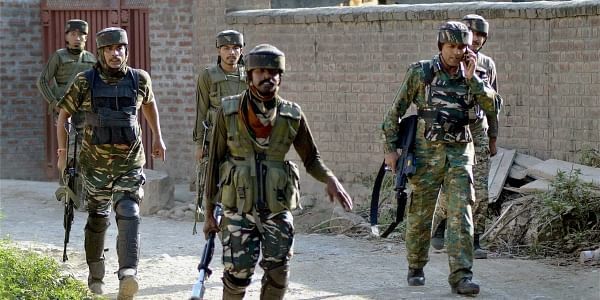 BANDIPORA: Arms and ammunition, including Under-Barrel Grenade Launchers, AK-47s and 10 hand grenades, were recovered post the encounter which took place in Hajin on Saturday. Congratulating the security force for their achievement, Jammu and Kashmir DGP S P Vaid said Hajin had been a difficult area to operate, but they are very clear in their aim. "Hajin has been a difficult area to operate. We have lost few of our soldiers in this area this year. But we are very clear in our motive and will continue with our operation," Vaid told ANI. Earlier in the day, Jammu and Kashmir authorities ordered to suspend data services, including 2G, 3G and 4G services in Hajin area of Bandipora district in view of the encounter. One Indian Air Force (IAF) Garud personnel also lost his life and two Indian Army personnel were injured in the encounter, which was started earlier in the day.